On May 29th, 2015, Praise and Divine Healing Service was conducted in cooperation with GBI DPR which is grazed by Rev. 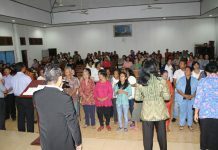 Frans and GKII at DPR housing complex, grazed by Rev. Sembiring in Banjarbaru, South Kalimantan. At 6.30 PM congregations began to arrive on foot or by vehicles. It appeared that those who came, many were sick. As praises were being raised the whole congregations praised God with joyful faces. Word of God was delivered by Rev. Jong Johan (KPPI team) from Isaiah 53: 2-5 about the sacrifice and love of the Lord Jesus for His people where God would bear whole of our sins and evil and give His life for all of us. Then followed with delivering the Word taken from John 5: 1-9 concerning the Lord Jesus healed the lame man in the pool of Bethesda. The servant of God invited the congregations to believe in the Lord Jesus as Lord and Savior in their lives. 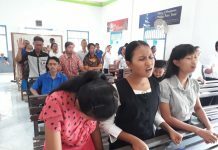 Then the sick congregations were asked to come forward to be prayed by the counselors. Praise God that evening the Lord Jesus cured all sicknesses such as shortness of breath for 4 years, right-sided stroke hand and leg which could not move, blind since childhood, left-sided stroke hand and leg that could not move, there was a congregation who came, already 5 days got fever and her head was very dizzy, praise the Lord the healing occurred upon her and God cured other diseases as well. Thank God! 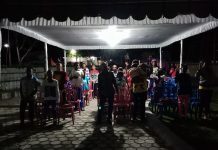 In the evening God visited the city of Banjarbaru. Glory only to God!